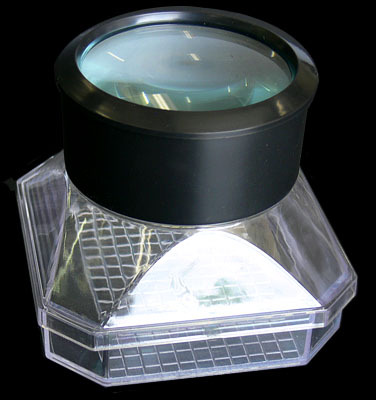 Our Magnifying Viewer is ideal for observing bugs and insects in their natural environment, examining of rare coins & stamps, and a host of other magnifying applications. 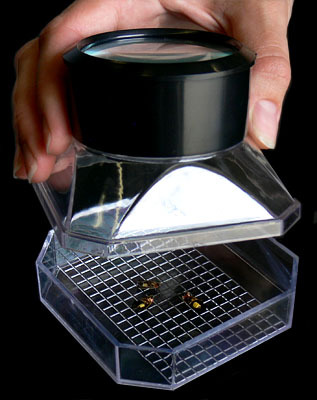 For insect use, it is far superior to an ordinary magnifying glass as the integral chamber keeps the insects captive and in focus at all times. The high impact transparent plastic chamber is big enough to contain most bugs and insects, opening easily so specimens can be quickly inserted without them escaping. Mounted above the large case is a 2.5 power magnifying glass, allowing you to observe and identify body segments, color patterns, and watch insect behavior. Etched 5 mm squares on the bottom make it easy to measure specimens. The magnifying bug viewer makes a great gift for entomologists, coin collectors, stamp collectors or just as a handy tool to have around when needed.